This story is very much in progress, as we have a broken down vehicle currently sitting on the other side of the Sound—and many miles yet to drive. I must admit as well to be currently bogged down with frustration over the dealings with repair companies, rentals, and the like. This evening I couldn’t have been more honest when I told T that I wished, more than anything, that I could accept her invitation to play with her in the backyard. Oh, how I wanted to play! Yet the business required for the next day had to be done . . . business that looms still. So though the business looms, we are, for now, safely settled—for this one evening at least—with family. As such, I can tell Phase One of this tale . . . The day began ordinarily enough: we had spent a good evening at my cousin’s home, treated to sweet hospitality and some fun crazy kiddo time. And the start of the travel was smooth, heading to a lunch with some of Peter’s old friends. He enjoyed the time to talk; I was happy as a clam to be swimming and trampolining with their girls :-) Next stop: Ferry ride #1. No problem. A short drive later we arrived at the port town for Ferry ride #2. Entering the town, though, we heard some strange sounds from the engine. Soon it was clear that we needed immediate repair. As the car was still running, we thought we could get as far as the ferry and then deal with repairs once on the other side, with my brother. We made the wrong call. While rolling into the landing ramp, after purchasing our ferry ticket, the engine gave up. It was done. My heart sunk as I realized we would not be able to get to my brother’s. This was the last ferry of the evening, and besides, how could we get any repairs done if we left the car in order to visit them? After a few calls made to towing companies and to my brother [towing companies were AWOL, neither answering the phone or returning my messages], we were getting desperate. We had to get out of that lane in 10 minutes. The lady officiating loading and unloading was kind enough to talk to us as we tried to find a solution, patiently waiting while we figured things out. She then went further and arranged for a driver to come push us, when we suggested we could push our car into the adjacent long-term parking lot. This was blessing #1. About this same time, I got another call from my brother. He told us his friends were out boating and had just offered to come get us: they were at a landing nearby and were on their way to meet us. Though worried about leaving the car, we quickly accepted the offer, knowing that our priority now was getting to see the family. I envisioned a dock nearby, so was surprised when it took a good 20 minutes for a lady to arrive. Turns out, she had waded in order to get to the beach and had then hoofed it for a good distance to find us. We quickly resorted our belongings, paid for parking, and put a few extra layers on. I was soon extremely grateful for these layers. The walk to their boat was, in fact, a bushwhacking session, crawling through downed trees and sliding down hills . . . baggage in tow. We finally found an entryway onto the beach. By this point, the earlier stress was gone: instead, I was gazing at the sunset with a stunned feeling of “What in the world are we doing?! ?” But soon enough, a speedboat made its way towards us and lowered its anchor. We shed our shoes, tossed our baggage into the boat, and climbed in ourselves. The hour-long ride was a cold one, but happy. We had intended on picnicking while on the ferry, so we huddled there in the bottom of the boat, shielding ourselves from the wind as we ate and drank. And oh, how sweet it was to see my brother, soon thereafter, at the top of the hill waiting for us! 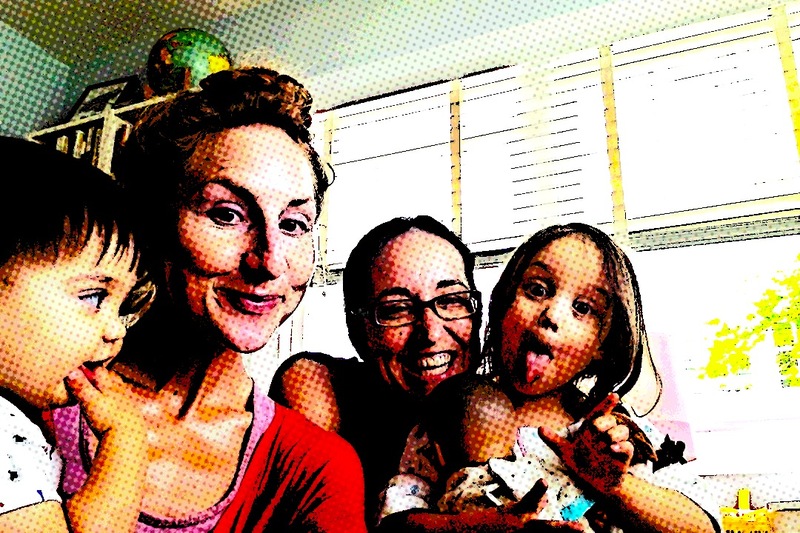 How sweet to have a full day to hike, picnic, and swim with nieces: a day that was a lesson in accepting the blessings, and the angels that come along, even when the days to come are uncertain. Lord, let us trust that You will not forget us . . . that Your goodness will continue as long as . . . we both shall live? we are gathered . . . I wish I could have pushed the “pause” button. It’s over now and, I must admit, in one way I’m just relieved that it is. There was a fair bit of angst and agonizing leading up to it, with all the things involved in planning such an event: things that my unskilled-at-event-planning-self was utterly overwhelmed by. But when it came down to it, the most beautiful thing happened—I was able to feel like just my normal self throughout the day; and that normalcy was really the most heaven sent gift that could have been given. We started out on a jovial note: my maid of honor and I woke up to the delivery of coffee from my brother. He asked me about it beforehand, saying “Hey, it seems like a cool thing to do would be to bring you a wedding day coffee. Never heard of anyone doing it, but I think I’d like to—what would you like?” A short while later the van showed up, and my family members began comparing their selections of choice. As she does, mom proudly displayed her cup and spelled out the drink, while the rest of us raised our eyebrows at her customarily froo-froo brew, compared to our more stout selections. I got to be the morning hero, doling out a few prized gummy bears to my niece before sending them off for some serious bulk shopping. My mom, you see, had offered and, later, insisted (when I was worrying about the workload and asking if I could take the job away from her) on managing the food herself. She has this ability to just sail through tasks like that that others of us shrink from in horror. I don’t know how she does it but, when she told me she could handle it, I admitted that I have 34 years of experience to prove that yes, no matter what “it” may be, she can indeed handle it! Sure enough, she managed to pull off, with the happy hands of several willing family members, a full spread of fabulous picnic fare, perfectly suited to our barn reception. In fact, she pulled off the same sort of feat with my flowers. After some comical arguments in the planning process, she ended up surprising me at the last minute by doing the flowers that I had hoped for, but that she thought she couldn’t do with logistics such as Southern heat involved. There they were, though: daisies and wildflowers lovely as anything I could have pictured! I now sit in a bit of a stunned state, awed by the displays of love and kindness that we have benefitted from all along the way in the year leading up to this day. How do you say thank you for gifts that go above and beyond in so many ways? And is it even possible to do it adequately when such displays are just the latest in a lifetime of them? I guess that’s what happens with family: there’s just no rhyme or reason for the things we do for those we love. And for all the ways I want to now list things out and track them in an organized, librarian fashion, I wonder if maybe this is a category in which I will have to accept failure . . .I am destined to fail in the task of paying back all the love that has been given. So be it. One of the things I have heard with some regularity over the last few months has been that “It’s your day!” This would generally be prompted by some sort of agonizing on my part about how to make the best decision: the one that would please the most people. I have generally waved off this comment. Depending on my mood at the time, my response would be either some sort of sarcastic statement about how, obviously, everyone BUT me was in charge of the decisions. Or, more commonly, I would launch into an attempted explanation of how my own happiness hinges so heavily on that of my family members that I cannot be pleased with a choice unless it seems to be one most likely to please the most people. Yet, inasmuch as I feel incapable of shaking this mindset, I am fully aware that it will send one running in circles faster than a pup chasing it’s own tail. On this end of it all, I am starting to suspect that the truth, for me at least, may be something of a rather different slant. Maybe the decisions and people involved were, in fact, about everyone else. But maybe that “everyone else” includes me as well. For if the day belongs to the whole family, then the day also inherently belongs to me, as a part of the same. And when it came down to it, I truly did feel like it was my day—even in the parts that I just stepped back from altogether. Because I am the one who gets to mull over, and claim this day for the years to come. 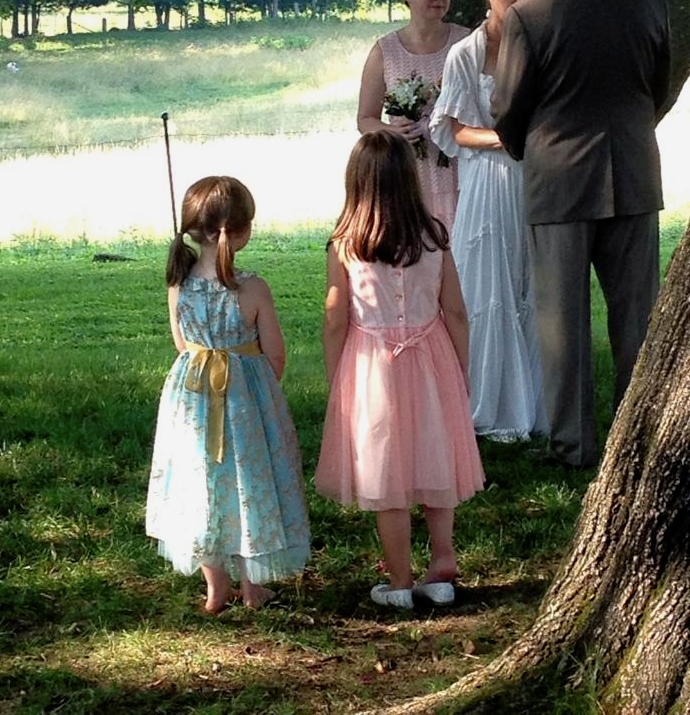 I get to picture the look on those two little flower girls’ faces as they waited for me to tell them when to walk. I get to remember fumbling with that little one’s sandals after she, noticing my own bare feet, asked if she could walk barefoot as well. A successful last-minute wardrobe change there in the grass behind the wedding guests. I get to remember a spur of the moment tossing of my bouquet to that same little one as we left for the evening, and the smile on her face as she caught it. Thanks be to the Giver of all, in whom is found such kindness that He would deign to grant us times designated solely for the purpose of basking in untainted Joy. All I can figure is that He must get a kick out of dispensing doses of extraordinary grace. Otherwise, the amount with which I have been favored would be ridiculous. Twice, you see, in the span of two days, I have exhibited shining displays of, er, brilliance. And twice, in those same two days, I have been spared the consequences. Quite miraculously, I might add. Part II. So after a pleasant day spent with my cousin and her rowdy little ones—a day spent in part preparing for the road trip to come and in part being on kid-duty, R and I hit the road the next day. We picked up some necessary items at the mall, and then picked up some food-to-go before hitting the highway. This first day was a short day so far as travel goes, with only one state between us and our destination. She was planning to spend the next state’s visit with her cousin, and I had made plans to stay with an old college roomie. As I neared her house, she told me that she was going to request a night off at home, so that the two of us could go out when I got there. 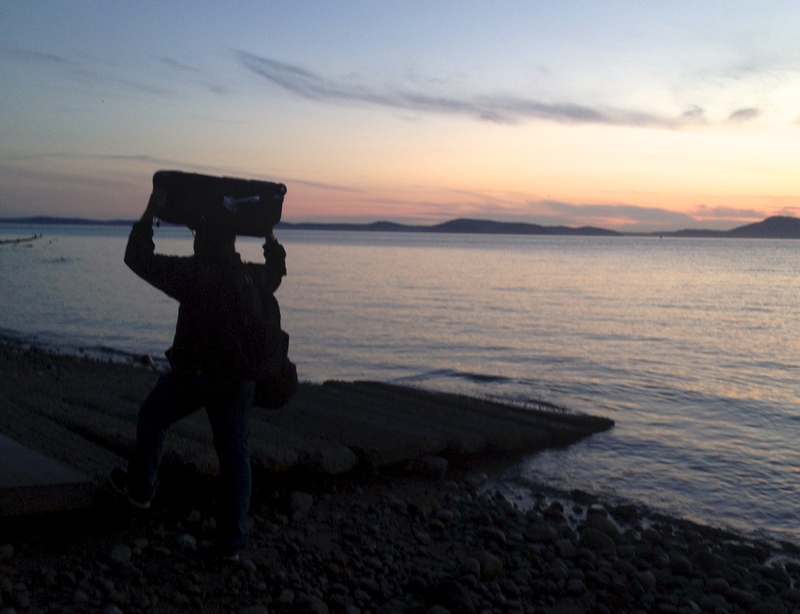 We were giddy with the prospect by the time I arrived, quickly packing our swim bags after dinner. When we got to the soaking pools, we were asked for our ID’s. I reached for my wallet. I then dug for it. Then dumped out my backpack with a befuddled expression. “Um . . . I don’t know where it is. “ They seemed a bit amused when I instead handed them a photocopy of my passport. “Will you take this instead?” I asked. I explained that I always have passport copies stashed in various places. They nodded as if they understood, but I don’t think they quite tracked with me there. They did accept the form of ID, however. Though pleasant enough, I must say that our soak was not all that relaxing for me. I could not help but obsess over the wallet, racking my brain over where it could be. Finally it hit me: the last purchase I had made was a state earlier. I looked up the location of the coffee store, my friend helping me find the phone number, and we ended up juggling our two phones as we sat there in the pool. I almost couldn’t bear the suspense of asking, when the salesperson answered. But he cheerily enough informed me that he had my wallet. Fast forward a day and now you will find me with my valuable possessions in the mail, on the way back to me. This cafe not only held my wallet safely for me [presumably leaving all the foreign currency in tact ;-)], but they offered to ship it to my next destination in the road trip. And there you have it. That was this morning. By this evening, I was consumed with chasing a 3-year-old around the playground and laughing with her mom over the profundity of her comments. Grace. Life is grace. And maybe, by definition, that makes it extraordinary . . . There were a lot of tears this week. Tears of others, and those of me. The other day I had one last walk with M. By this point in the series of goodbyes, my eyes were dry. I couldn’t really cry anymore. Business had to be done. My home needed to be packed up; bags needed to be packed for the next leg of summer travels; people on the other end of those travels needed to be contacted; wedding planning needed to be done . . . No time for tears. Instead, I told her that I couldn’t really handle saying goodbye, so I was going to just pretend that it was just another afternoon walk for us. We had even opted for a boring walk around the school playground, choosing something as normal as possible before our normalcy would be gone. As we talked, we spoke of next year. We prayed for the holes in each of our hearts to be filled. Our friendship had been a gift, filling a neediness in each of us. We must, then, trust that this neediness next year will be filled. Somehow. Then, as our time ran away from us, we hopped on our bikes, as usual. We biked slowly together towards the school entrance, as usual. We waved, as usual. “Have a good evening,” she called out. “You too,” I replied. “See ya tomorrow,” I lied. I turned into my gate and clenched my teeth. So much for those dry eyes, I muttered to myself, as I blinked my way home. I should be used to this. This is the nature of life here. Sometimes I’m the one leaving. Sometimes I’m the one staying. I don’t know which is harder. I do know that it gets harder the older I get, which I didn’t expect. And that is where, I suppose, He gives provision as needed. This time I say goodbye to some as I stay put and begin a very new sort of journey. This time it is a journey into consistency . . . a journey into commitment; connubiality; conjugality; name your synonym, I suppose :-) That most normal, yet most mysterious of gifts. Lord grant me the ability to embrace this new season with a grace beyond me.